Residential security should be important to everyone, whether you live in a house or an apartment, knowing that your home is protected provides a peace of mind, both when you are away and at home. We can help you choose from a wide line of security products, designed for your specific needs, to find the right combination to secure your home and protect your family. Portland Security Alarm ® offers security systems that automatically dispatch the police and/ or fire department directly to your home in the event of a burglary or fire, with the best state-of-the art 24 hour monitoring service, every day of the year, keeping your home, family and possessions safe from real and potential threats. Your home needs to be a place where you and your family feel safe. Installing an alarm system will secure your property, reduce the risk of a break in, and protect your love ones. 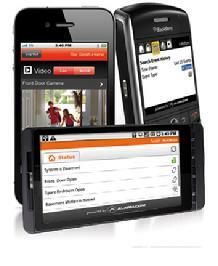 Portland Security Alarm ® have a wide variety of products and services to meet your home security needs. Now you can check your home security system while on vacation or at work, send commands from a computer or cell phone. Using Alarm.com on line, or via interactive mobile apps, you can monitor everything that happens, not just home security alarms. Access your home security system remotely to look in on your children or pets by pulling up a live video feed from cameras in their favorite play areas. Monitor activity on entry doors, windows, liquor and medicine cabinets, safes, drawers, and more. Contact us for more information on our customized home security solutions. Call 503 255-8370.